The Soul Cairn is a plane of Oblivion haunted by lost Souls, added by the Dawnguard add-on. Your first visit to the Soul Cairn will be with Serana, during the Dawnguard main questline. When Serana adds her blood to the other ingredients in the portal vessel found in Valerica's study, the stone circles on the lower level split open, rising up and spinning around to form a curved staircase leading down from the balcony to the portal. If you are not a vampire or vampire lord, you will need to have part of your soul trapped by Serana. 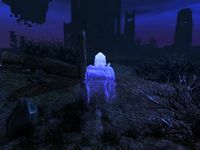 The Soul Cairn is primarily inhabited by souls—wandering non-hostile spirits that were sent here because they were soul trapped before being killed. Interacting with these spirits, they will usually comment on how lost or confused they are, or how desolate or horrible the Soul Cairn is. For more information on the Soul Cairn, see the lore article. † She will relocate to her study, once advised of Lord Harkon's death. Once you arrive, you can still see the stairs ascending to a hole in the sky surrounded by darkness. The sky within the Soul Cairn ranges in color from blue to black and purple. There are many black structures all over this plane of oblivion, and also seen beyond the boundary, which is clearly defined as a shimmering blue magical barrier (see bugs). The landscape is completely alien to all your points of reference. There are black skeletal trees and bushes, with soul husks the only plant that can be harvested growing within the Soul Cairn. 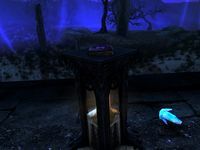 There are many upright black stones similar to overly large grave stones and the bones and skulls of dragons scattered throughout the Soul Cairn. If you look straight up at the sky you will see what appears as a giant black hole, much like Sovngarde. Soul husks appear like strange clusters of sand-colored and sand-textured cones sticking up from the ground. They can be used to counter the effects of the giant floating health-draining gems that may be found at the top of the various structures found within the Soul Cairn. Soul husks are also the only currency used when trading with the spectral merchant, Morven Stroud, for various enchanted items and spell tomes. Soul fissures are another common feature of the Soul Cairn; they are cracks in the ground with air rising visibly out of them, which causes them to emit a hissing noise. When you activate a soul fissure it will fill the largest soul gem in your inventory, filling black soul gems first. While traveling here, you will be attacked by bonemen, wrathmen and mistmen. There are also a few unique creatures to be found here, namely: Durnehviir, a cursed undead dragon; three keepers who maintain a barrier around the Boneyard; and the Reaper. Bonemen appear like black skeletons. Once defeated, they collapse like normal skeletons, but then their remains become soul embers, which are clear black puddles similar in shape to a defeated ice wraith. They typically carry ancient Nord weapons which can be looted along with soul gems, various alchemical ingredients, gems, jewelry and soul husks. They are the most common of the creatures found within the Soul Cairn. 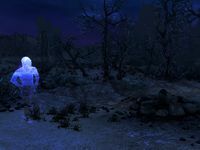 Wrathmen appear similar to ghostly draugr, who typically carry random two-handed melee weapons. Their remains also turn to soul embers after dying. Their weapons, but not their armor, can be looted along with similar minor loot to bonemen. Mistmen appear similar to the corrupted shades found in Kilkreath Ruins, and seem to favor magic as their main form of attack, although they will pick up dropped weapons. Their remains also turn to soul embers after dying and carry similar minor loot to bonemen. The keepers are tall, armored foes with black, smoky heads, armed with dragonbone weapons and carrying black soul gems. Their weapons, but not their armor, can be looted if your level is 45 or higher. When defeated, their bodies dissolve into ghostly remains, the same as the various guardian spirits faced during Kyne's Sacred Trials quest. There are many structures scattered throughout the Soul Cairn. Some of these are buildings containing a chest. They are typically guarded by the various hostile creatures. 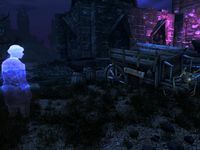 Some of the structures have bars blocking access, with pairs of standing stones nearby with glowing bluish-green balls near the top. Hitting the orbs with ranged spells or bow shots will lower the bars and grant access. You will also find well-like structures dotting the landscape. 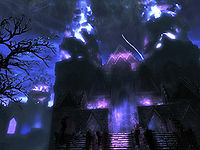 Most of these emit a purplish-white glow from the top, similar to the focus points in and around the College of Winterhold. Standing in these causes your health to regenerate. There are smaller wells that do not glow; jumping into these will teleport you to a nearby, previously inaccessible area. Yet another structure found is a lightning attractor, which is activated by placing a grand or greater soul gem into a holder, which will then cause lightning to strike the rods, turning the soul gem into an empty black soul gem. Using these lightning attractors will summon several hostile creatures. The portal takes you to the southwestern edge of the Soul Cairn. There is a path heading north away from you. You can either choose to locate Valerica immediately, by following the path in front of you to the entrance to the Boneyard, or explore the Soul Cairn first and locate Valerica once you have defeated the keepers. Once they have been defeated, the barrier surrounding the Boneyard will fail, enabling you to enter the Boneyard and the Elder Scroll located there. The keepers are found by the tallest, most ornate towers in the Soul Cairn. The keepers are siphoning power from lost souls to maintain the barrier surrounding the Boneyard. By defeating them, the barrier will fail, enabling you to enter the Boneyard. There are several soul husks around the bottom of the stairs from the portal. By following the path north for a short distance, you will see a square black building on the right. There are stairs leading up to a doorway blocked by bars. To the left, on the ground, are a hunting bow and a quiver of iron arrows. On either side of the doorway are standing stones with glowing orbs near the top. Shooting both of these will lower the bars, allowing you to access the interior. Inside is a chest containing a soul gem or two, while on the ground in front is a random enchanted steel dagger, page 8 of Jiub's Opus and a random soul gem. A second soul gem is in a stand on the right. Continuing along the road to the north, you will see another building a short way off to the right of the path. As you approach, you will be attacked by three bonemen, two outside and a third inside the building. There are open doorways to the interior on each side of the building and three healing wells around the outside. Inside, there is a chest in the western corner, with a medium coin purse, a random soul gem and page 6 of Jiub's Opus on the ground in front. Further along the path, you will encounter a soul that appears to be looking for something or someone. When you approach, he will ask you to help find his horse, Arvak, starting a side quest to find Arvak's skull. After this point you may see Arvak, who is a skeletal horse with a blue flaming mane and tail. He will randomly teleport close to you, stand nearby, or run through the Soul Cairn. You are unable to interact with Arvak until you complete the quest and learn the spell Summon Arvak. The path passes through a gap in a tall black stone wall, with a flight of stairs leading up to the gap. To the left is a healing well and beyond that is a stone courtyard, with a building still further beyond. A second healing well can be found by exiting the building to the southwest. Inside the building is a chest containing quality loot. There is a wide exit on the far side of the building. Upon exiting through this, you will be attacked by a total of four bonemen who rise from the ground—two immediately in front of you and two on another smaller structure behind. Once they are dealt with, climbing the stairs on the building leads you to a chest filled with quality loot, with page 3 of Jiub's Opus and a copper and sapphire circlet on the ground in front. Take care not to linger as hanging in the sky above the chest is a huge gem, similar to a black soul gem in appearance, that drains your health. This structure is bisected by the boundary surrounding the Soul Cairn. There is a large healing well beside the structure, but nothing else of interest on this side of the building. Passing back through the building you have the choice of exploring the rest of this side of the wall before passing through the gap or heading straight for Valerica. Continuing to explore, there is a path heading west. Following it will enable you to explore the left-hand side of the original path. There are several soul fissures, soul husks for you to collect, and healing wells. When you arrive back at the stairs to the portal, you can cross and start exploring the other side, which is far larger. There is a building due east of the portal steps with two random soul gems inside, on the ground level, on a stack of squared off stones. A few paces north is a teleport well, which transports you to the top of the building, where you will be faced by a boneman. There is a chest at the far end guarded by a wrathman. It's only a short drop back down. Directly north of the teleport well is the spine of a dragon sticking straight out of the ground with a human skull on top like a totem pole. Next to it is a pedestal with a black soul gem. A few steps south of the teleport well are the skeletal remains of a dragon, with a human skeleton in its rib cage. Inside the remains there are ancient Nord gauntlets, as well as a steel sword of shocks. Near the southeastern corner of the Soul Cairn is a large structure with an interior courtyard, where two soul husks grow. There is only one narrow doorway in or out, with several flights of stairs leading up from the courtyard to the top of the structure opposite a tower. If you are facing the tower, there are stairs on your left which descend to a lower roof. You can either use the Whirlwind Sprint dragon shout or descend the stairs, follow the roof along, and then climb another flight at the far end to reach the tower. There is a large health-draining gem floating above another chest of quality loot. There is a discernible path heading north from the doorway to the courtyard that leads to a paved section with a lightning attractor beside a chest. In front of the chest are some skeletal remains, with a random soul gem nearby. Using the lightning attractor causes several bonemen and a wrathman to rise from piles of bones around it. Head towards the gap and, a short distance before reaching it, there are stairs leading up to the rear of the wall with a window that looks through to the other side. The window is flanked by flagpoles and there is a soul standing beside it, along with stacks of stones holding page 1 of Jiub's Opus, a copy of The Book of Life and Service, a random filled soul gem and possibly a random poison. Through the window on the other side of the wall you can see a chest. To reach the chest you need to pass through the gap in the wall and immediately turn east, then follow the wall back along until you reach a flight of stairs up into an alcove in the wall containing the chest seen from the other side; it only contains minor loot. To the north of this chest, you will find Morven Stroud, a former merchant of High Rock who found himself here after he double crossed some necromancers. He arrived complete with his horse and cart, and is the only merchant within the Soul Cairn. He is willing to trade 25 soul husks for any single random item. You can choose between: a sword, a battleaxe, a piece of light armor, a piece of heavy armor, or a spell tome. He has an unlimited supply of each option. So if you are after a specific enchantment, save/reload before speaking to him. He is standing or sitting near his wagon; his skeleton is laying spilt out from the wagon seat and can be freely looted for a few septims. At the rear of the wagon are some unusable barrels. On one of these is page 10 of Jiub's Opus. Behind Morven is a large building with a doorway blocked by bars. The orbs to shoot are on either side of you when facing the blocked doorway. The orb on the left is on top of the building. There are healing wells on either side of stairs. Inside the building is a chest containing minor loot. To the right of Morven Stroud is a flight of stairs up to a teleport well. This takes you to the very top of the same building. Dropping from the northern corner leads to a flat section of roof and another chest containing minor loot. You will only suffer minor damage. There is a third healing well behind the building. Following the main wall and barrier to the east leads to several structures. The first is purely a many-arched structure containing nothing of interest. The second is a tall ornate tower with what seems to be a lot of souls congregating around a tall, armored figure. This is one of the keepers. As you approach, up to four wrathmen will rise and attack. Once they are defeated, you will face the keeper, who carries a dragonbone battleaxe. During the fight, the souls that the keeper was draining vanish. A few paces further east is another structure with four pillars supporting the structure, with a typical shrine base underneath with the spell tome of Conjuring Wrathman on top. Upon taking the spell tome, two more wrathmen will rise and attack. There is a path to the east of this structure, follow it to find the Reaper's Lair. On the east side of this building, you will find a skeleton leaning against a large rock with a random enchanted greatsword and an ancient Nord helmet lying beside it. There is also a note which suggests that this was an accomplished adventurer who willingly entered the portal against someone's advice. Two wrathmen will rise and attack as you near it. The Reaper's Lair is the only building with a door within the Soul Cairn. To correctly call forth the reaper and its minions, you will normally need to collect three reaper gem fragments, although it is also possible to do this using fire runes (see notes). Full details of the lair are found below. Heading north from the Reaper's Lair, you'll come to a large paved area with several structures and flights of stairs that lead up to a lightning attractor. Using this will cause two bonemen, two wrathmen and a mistman to attack. Head south-west, passing the spiked roof of a building to another paved area with a healing well in the middle. As you approach, a boneman will rise and attack. Beside the well is a skull, a random shield, a random enchanted dagger, page 5 of Jiub's Opus, and three empty random soul gems. There may also be a random poison. North of the healing well, you will encounter Jiub either walking around an extinguished campfire muttering to himself or sitting beside it. He was a Dunmer adventurer from Morrowind, who was at Kvatch when the city was sacked by the legions of dremora during the Oblivion Crisis. Speaking with him, you can learn something of his history. You are also able to offer your services to help him find ten pages of notes for the second volume of his Opus. This will initiate the Impatience of a Saint quest. Once you've collected all ten of the pages, upon returning to him, you will be able to see his form and clothing far more clearly. He will be overjoyed and reward you with a unique book, Saint Jiub's Opus, and the locket of Saint Jiub. To the west is a large structure with a path leading around behind a wall. As you approach, a mistman, a wrathman and up to three bonemen will all attack. In the northern corner of the structure is a healing well. Nearby, along the northeast wall, there is a random enchanted steel war axe on the same raised section of paved ground. Look to the southwest, there is an entryway near to the healing well. Enter the structure and look to your right for a teleport well that takes you to roof above. There is a large health-draining gem hanging above a chest containing one of the reaper gem fragments in addition to quality loot. There is a second lower level to the southwest containing another chest of minor loot, with a sack containing a number of soul husks beside it. 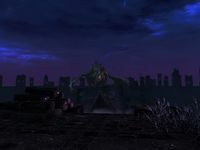 Northeast of this complex is an open-sided tower with a shrine base in the middle underneath; on top is Arvak's skull. As you approach, you will be attacked by two bonemen, a wrathman and two mistmen. Once you have dealt with these, take the skull, after which, the original owner you spoke to will appear a short distance to the east beside a healing well. Speak to him again and he will teach you the spell to summon Arvak. You can then summon him whenever you are outside. Continue heading northeast to find another tower with a teleport well inside. As you approach, two bonemen and a wrathman will attack you from the roof and a boneman, a wrathman and two mistmen will attack from the ground. You can teleport directly to the roof and then fight your way back down. Two flights of stairs down from the top, on the first covered section, is a copy of The Book of Life and Service. On the next level down you can see part of a long bow. Casting any magic at it will cause another boneman to rise. Back at ground level again, a couple feet north of the stairs is another dragon carcass with an enchanted battleaxe and a few orcish arrows. A few paces further to the northeast, are stairs leading up to a paved section, where a shrine base holds the spell tome of Conjure Mistman. 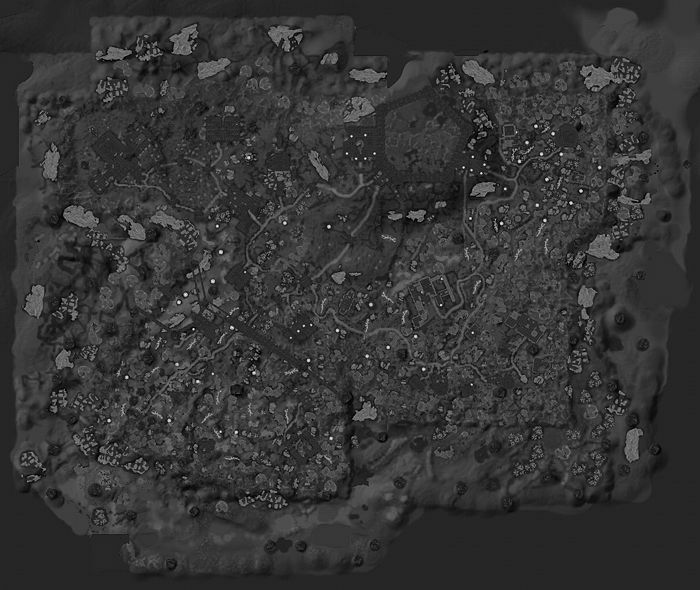 There is a small coin purse, an empty random soul gem and page 7 of Jiub's Opus all on the ground beside the base. You will encounter two mistmen upon taking the spell tome. North-northwest is a teleport well with three pillars around it, all underneath a floating island. It's at the end of a path and has two healing wells beside it. Entering the teleport well transports you on top of the island, which has a structure on top. Following it around counter-clockwise as you climb, you will pass several souls before reaching a keeper armed with a dragonbone bow. Behind the keeper is another teleport well which returns you to the ground beside the first well. Head west and you will soon see another large building with a large health-draining gem floating above it. Inside, stairs lead all the way to the top, where directly under the gem is a chest containing quality loot including one of the reaper gem fragments. Heading southwest, up the hill towards the Boneyard, you will see a building against the eastern wall with several flights of stairs leading up to it. At the top of the first flight of stairs, you will see a short covered passage on your right. There is a chest at the end of the passage with page 4 of Jiub's Opus and two pieces of silver ore on the ground beside it. As you approach the chest, a mistman will rise and attack from the pile of bones beside the chest. There is a path heading south from this building that leads to a healing well surrounded by upright stones. As you near, a boneman will rise up and attack. Turning and heading southwest leads past a soul acting as a farmer tilling land which is planted with fourteen soul husks, with two cow souls wandering freely. Head west from the large complex of buildings near Jiub to find a small paved area with a structure and stairs leading up to a lightning attractor. Using the attractor will cause a boneman, a wrathman and two mistman to rise and attack. From here, head west-northwest through a fairly barren area and you'll eventually reach a large structure with two tall pillars of black stonework that mark the beginning of an underpass. It's on the southern side of the structure and there are two bonemen patrolling the underpass. Inside the building, stairs lead up and counter-clockwise until you reach a health-draining gem hanging inside the building above a chest containing quality loot. To the southwest is a paved area where a soul is standing over a lootable skeleton with a large coin purse beside it. Next to this is a building with stairs leading up to a blocked off area with a large health-draining gem hanging in the sky above. As you reach the top, four bonemen will rise and attack. One of the orbs that you need to hit to lower the bars is above them; the other is under the pitched roof farthest from the bars. Beyond the bars is a chest containing quality loot, with a soul sitting beside it. To the west is a shrine base sitting on some stonework with a sack of soul husks on the ground beside it and surrounded by several growing soul husks. Beside the base is the spell tome of Conjure Boneman and two random soul gems. As you approach, a horde of at least five bonemen will rise and attack. Heading further west is another large building. As you near it, you will pass under a small arch. On the far side is a boneman, three wrathmen and two mistmen. It is possible to deal with all of these by staying in the entrance. A keeper is leaning against the wall in front of you, armed with a dragonbone mace. To the left is a flight of stairs leading up to an area blocked by bars. One control orb for these is on your right at eye-level and the other is high above the blocked doorway. Shoot these to access an area with another large health-draining gem in the sky over a chest containing one of the reaper gem fragments and some quality loot. As you approach the chest, two bonemen rise and attack. Take care as you may be within range of the health-draining gem during the fight. There is a teleport well to the right of the keeper which takes you to the top of an L-shaped roof section above the well. There is a quality chest at the other end of the roof and a lightning attractor where the roof turns. Using this will cause a boneman and a wrathman to rise and attack from the piles of bones on either side of the attractor. To the west of the main structure is a teleport well on a small paved area with many upright stones around it. It takes you onto a raised section where a mistman rises from a pile of bones, beside a skeleton which is near an extinguished campfire with three random potions of healing, magicka or stamina, a random potion of strength, a scroll of storm thrall, a dragon priest dagger, a random staff, a medium coin purse, three soul husks and a knapsack. Take care when dropping back down to the ground or simply use the Become Ethereal dragon shout to avoid damage. Northeast of the building containing the keeper is a large complex building. The main entrance is on the southern side, which leads into a maze of short dead-end passages where an occasional boneman, wrathman or mistman guards a chest. There is a sack of soul husks near one of the chests, which also has a copy of The Book of Life and Service beside it on the ground. There are two loose soul husks and a daedra heart on some stonework on your left, near the passage with horizontal bars at either end. The passages eventually lead to a teleport well with grating above it, which takes you directly above. Stairs lead up to a chest under a health-draining gem. The chest will be empty if you are a vampire, or contain the soul essence gem if you were partially soul trapped in order to enter the Soul Cairn without becoming a vampire. Around on the far side of the chest is page 9 of Jiub's Opus and a random empty soul gem. On the west side of the entrance to the Boneyard is a large structure with an inner courtyard accessed by a narrow passage. Inside you will find what looks like a word wall, while in front is a typical boss-level chest, page 2 of Jiub's Opus, a ruby and a small coin purse. Return to Jiub to complete that quest and then head to the entrance of the Boneyard. Approaching the entrance to the Boneyard you will find Valerica. She will rush to her daughter asking about her husband. 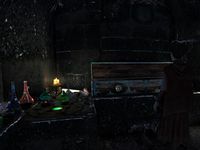 She has set up an alchemy lab to the left of the entrance and has a copies of Physicalities of Werewolves, Immortal Blood, and The Book of Daedra. A Cure Disease potion recipe and three soul husks are beside it. After a conversation between you and Valerica, she will lead the way into the Boneyard. The Boneyard is an enclosed area within the Soul Cairn, accessible after defeating the keepers. Upon entering the Boneyard, you will pass along a narrow passage before it opens out into a large courtyard. Surrounding the central courtyard are raised sections with stairs leading up to healing wells. As soon as you enter, Durnehviir will be flying around in the sky and bonemen will begin to rise. It is best to concentrate on fighting the dragon as bonemen will continue to rise to replace their fallen until you defeat Durnehviir, at which point any remaining bonemen will immediately die. When you have defeated Durnehviir, you will not absorb his soul like other dragons. You will only be able to loot the body if you catch it quickly, before it burns up to nothing (and you will get bones as usual, but no scales or heartscales). You can now either follow Valerica or just investigate the alcove to the southeast on your own. Valerica will be surprised when you vanquish Durnehviir since, from what she's read, he couldn't be killed. She then ponders that you may have only displaced his physical form while he reconstitutes himself. She tells you that she has no idea how long that will take. Once you have the scroll, the exit can be difficult to see, but is to the southwest. Upon exiting, after defeating Durnehviir and retrieving the Elder Scroll, you will find Durnehviir re-forming ahead on a small structure. Don't attack him if you want to acquire his dragon shouts. He will teach you Summon Durnehviir right away, which lets you summon him to fight for you anywhere in Tamriel, provided you're outdoors. Then, each of the first three times he's summoned, he will also teach you another word of Soul Tear. Alternatively, you can attack him immediately, before he has a chance to speak. Once you defeat him again, you can loot 5 pieces of dragon bones from him, but you will still not absorb his soul and you will miss out on the two dragon shouts. While traveling back toward the portal, you may be ambushed by three bonemen, who rise from piles of bones on your left as you proceed south. The Reaper's Lair is an enclosed ruin located in the Soul Cairn. The Reaper is a shadowy figure armed with a battleaxe and carrying a daedra heart and three empty black soul gems. Several bonemen rise to help him fight. Once they are all defeated, you can loot his ghostly remains, however you may be unable to interact with the soul embers of the bonemen. In the center of the circle is a square grate over what appears to be a teleport well, however there is no way of accessing the well below, which does nothing in any event. The Soul Cairn may be re-entered at any time. However, if you enter as a vampire and are subsequently cured of vampirism, you'll need to become a vampire again in order to re-enter. As the Soul Cairn is technically outside, it is possible to use the Storm Call dragon shout to summon a storm. The area becomes cloudy and almost appears as if it's part of Tamriel. The Soul Cairn is roughly shaped like an upside down (larger part up) figure 8 when viewed from the entrance stairs. It is oriented with the stairs towards the southwest and the Boneyard entrance to the northeast. There are two massive walls in the Soul Cairn. One divides the figure 8 with about 1/3 on the entrance stairs side with one gap roughly in the center. The second wall surrounds the Boneyard, separating it from the Soul Cairn. If you turn back into a vampire in the room containing the entrance to the Soul Cairn, you'll need to exit and re-enter the room before you'll be able to re-enter the Soul Cairn. It's possible for the "health drain" visual effect to stick to your character, even when not in range of one of the giant floating soul gems. The health drain effect does not follow, but it can become visually obstructive. This is easily remedied by walking within range of one of the health draining gems without using the effects of a soul husk, and then stepping away. The Conjure Mistman spell tome may be stuck at the bottom of the podium with only one corner visible and not able to be grabbed. A workaround is to press ~ to bring up the console and enter tcl to enable noclipping and go underneath the pedestal to get it. Go back aboveground and enter tcl to disable noclipping again. You can also shoot an arrow at it to knock the book down, then go and grab it. It is possible to get beyond the blue barrier surrounding Soul Cairn. In the first half of the world, access an enclosed area (where page 3 can be found) through a building located to the left of the passage to the other half. There is an invisible gap between the wall to the left and the barrier. When using Dawnbreaker within the Soul Cairn, the mass turning effect from exploding undead can sometimes cause neutral souls to enter combat. While they will not attack and cannot be harmed, Serana will get stuck constantly casting spells at them until the player loads a previous save or fast travels. ? Sometimes, after defeating Durnehviir, Valerica will tell you to follow her and then not move. Using Unrelenting Force will blow her away, after which she will pick herself up and begin moving normally again. ? In the Special Edition, you may experience significantly reduced frame rates while in the Soul Cairn. This page was last modified on 22 April 2019, at 05:44.